We recently wrote about some concerns by Vint Cerf and others that the FCC was considering a proposal to move some of their network diagnostics efforts -- which are a really good thing -- from the open M-Labs solution to proprietary servers run by the telcos. As we noted, the telcos denied that this was happening -- and Henning Schulzrinne, the CTO of the FCC, showed up in our comments to strongly deny that such a proposal existed. Yesterday, Vint Cerf distributed an open letter regarding concerns about the Measuring Broadband America measurement infrastructure. We share the objectives of the letter writers that “Open data and an independent, transparent measurement framework must be the cornerstones of any scientifically credible broadband Internet access measurement program.” Unfortunately, the letter claims: “Specifically, that the Federal Communications Commission (FCC) is considering a proposal to replace the Measurement Lab server infrastructure with closed infrastructure, run by the participating Internet service providers (ISPs) whose own speeds are being measured.” This is false. The FCC is not considering replacing the Measurement Labs infrastructure. As part of a consensus-based discussion in the Measurement Collaborative, a group of public interest, research and ISP representatives, we have discussed how to enhance the existing measurement infrastructure to ensure the validity of the measurement data. Any such enhancements would be implemented solely to provide additional resiliency for the measurement infrastructure, not to replace existing infrastructure. Any data gathered would be subject to the same standards of data access and openness. It turns out his claim that "this is false" is... well... false. Attached below, we have the proposal that supposedly doesn't exist. To be fair, this is just a proposal, and the FCC need not accept it. But to claim that there is no proposal to replace M-Labs infrastructure seems to be false. Also, the proposal certainly doesn't wipe out M-Labs servers, but it does clearly allow for the substitution of "ANOther server" in place of the M-Labs offering, as well as increasing the role for the telcos own servers. Given how the telcos have generally acted towards open information and data sharing concerning network data, you can see why supporters of M-Labs would be quite reasonably concerned. In fact, the relationship between everyone involved in these kinds of measurements appears to have gone through some rocky periods over the last few years, such that supporters of M-Lab are reasonably worried that there's a concerted effort to gradually move them out of the process. One thing that's notably missing from this article is a source. Where did you get this proposal from? I just go with it can't be true or false because the sentence is nonsense. Uh..."TRUE". I'll go "true". Huh, that was easy. I'll be honest, I might have heard that one before, though; sort of cheating. It's a paradox! There is no answer! Look! This place is going to blow up if I don't get back in my body! I was having so much naughty fun with your body, gonna be awkward when you get back. Oh your one of those smelly OWS hippies. The FCC�s authority over the Internet is made up (by them) and should not be allowed to endure. The FCC appointed pinheads are accountable to no group of voters and should be forced to follow the previous federal court�s decision calling into question the FCC's authority for any regulation of the Internet. Congress, our elected officials who are �accountable� ;-) to the voters (see SOPA), are the de facto trustees of the Internet since it is WE THE PEOPLE�s Internet. I want to be able to call my Congressional offices and hold THEM accountable, I can�t do that with the FCC. Vint made a relatively absolute claim that I'm not sure is so absolute in the proposal. You're right that the proposal does seem to be designed to allow for the later back-door removal of M-Lab from the scheme (subject to replacement by another "research platform," which is not defined in the document but does seem to be inherently opposed to ISP ownership), but it doesn't require that. 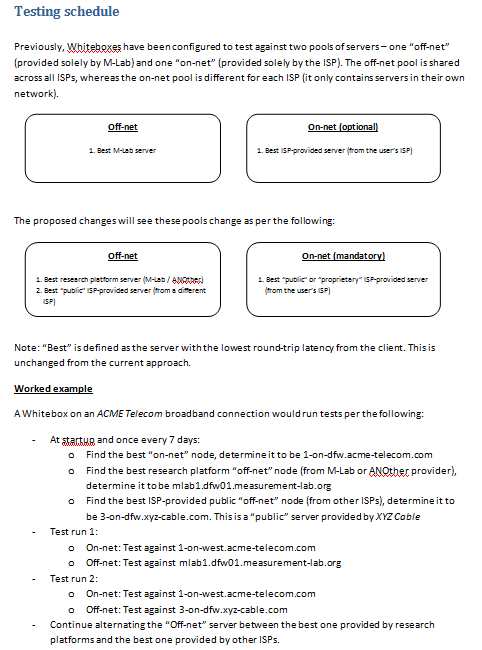 It does say that "The above approach will allow us to use 'on-net' results in the future as our primary data source for reports"; however, it also states fairly clearly that the off-net data (including research platforms) must keep being used in case the ISP's internal numbers are off, in which case the ISP's internal numbers can be discarded. I'm afraid that I have to side with Henning Schulzrinne in rejecting any reading of the proposal as absolutely replacing M-Lab. Oh, and SamKnows wants sudo rights on every ISP-owned test server so they can check why the ISP's suddenly giving them bad data. I like that idea.